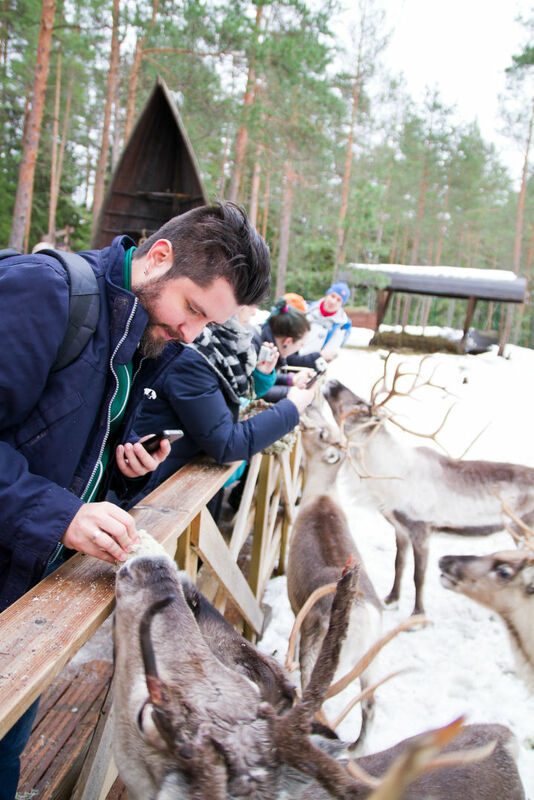 Experience a touch of Northern Magic in Nuuksio reindeer park which is the southernmost place in Finland where you can see reindeer. 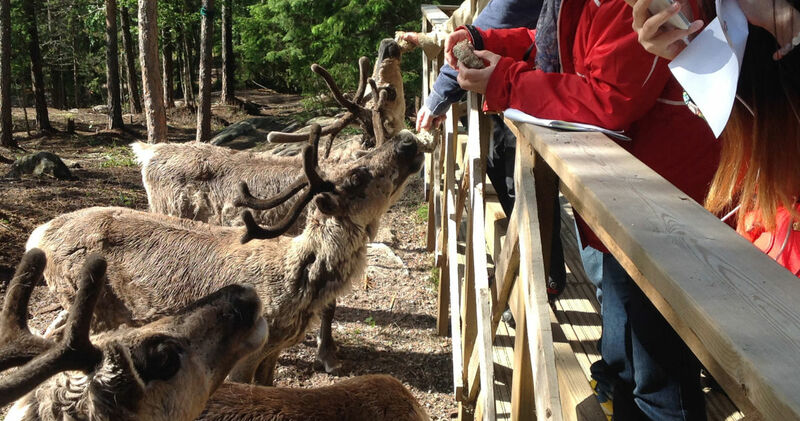 Meet our adorable reindeer at a close range and feed them with lichen. You can also enjoy dinner or coffee in the atmospheric kota by the campfire. Sea & Mountain Adventures Ltd. is a family-owned company which has hosted top-quality events in Helsinki metropolitan area, in Nuuksio National Park since 1994. Our idyllic log cabins Bear’s Nest and Safarihouse, Lappish tepee ”White Reindeer” with live reindeer and ”InipiSpa” sauna/bath by the forest pond provide a relaxing setting for various events. We offer services also in beautiful peninsula of Porkkala (45 min. from Helsinki) where our log house Villa Eagle Rock is located. Our professional guides ensure you safe and memorable activity programmes throughout the year. Tasty meals from packed lunch to three-course dinners are prepared with pure ingredients in our own restaurant kitchen on the spot. We are a partner with Visit Espoo, Metsähallitus and Finnish nature centre Haltia. 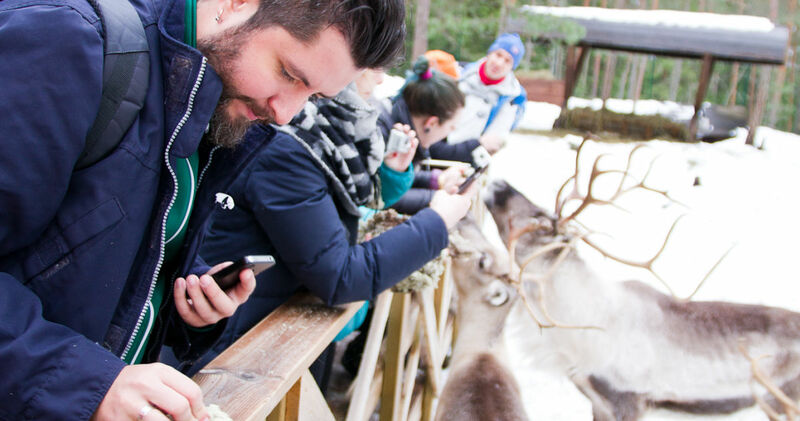 Experience a touch of the Lappish exotic with reindeer in Nuuksio reindeer park which is the southernmost place in Finland where you can see and feed reindeer. 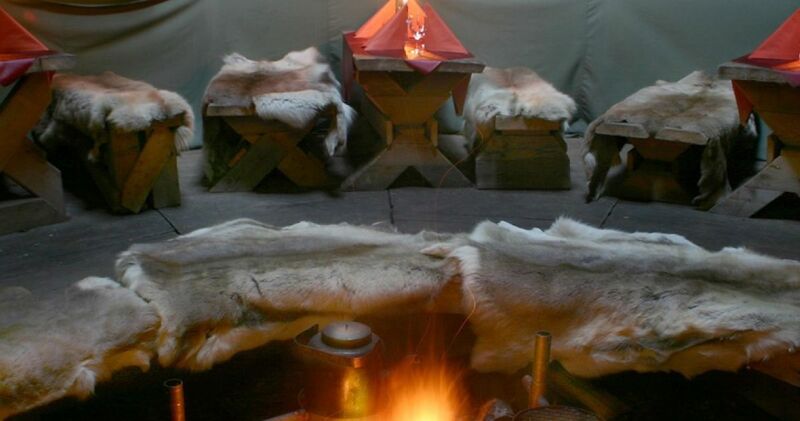 You can also enjoy brewed coffee with Lappish cheesebread, grilling sausages or stickbun on an open fire or delicious glowfried salmon or game dishes in an atmospheric wilderness style of tepee restaurant "White Reindeer”. 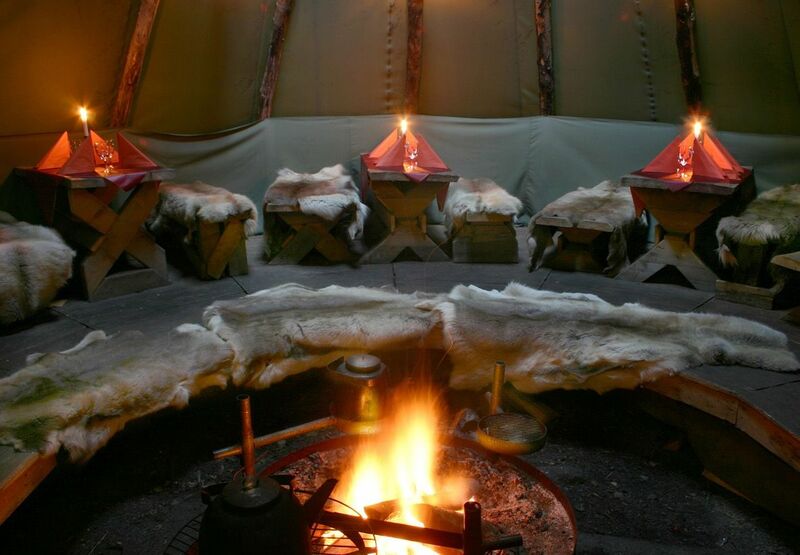 The tepee has a capacity of about 40 persons + outdoor terrace from where you can admire the reindeer at close range. 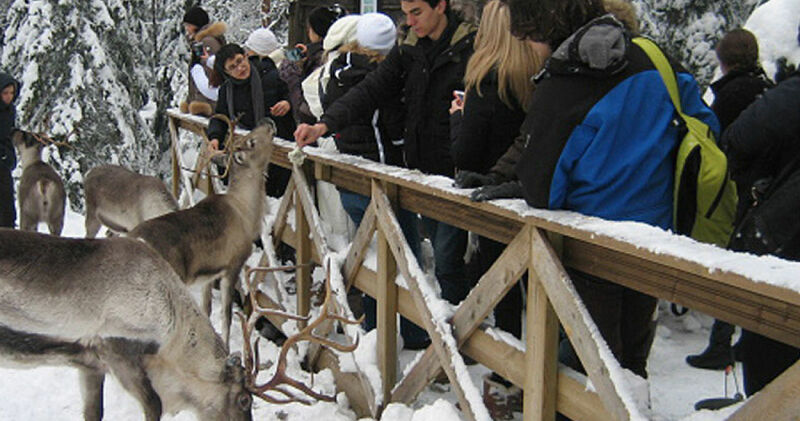 "White Reindeer” kotarestaurant is fully licenced and it is open for groups on reservation basis. We also offer nature program services to an additional request such as: Guided nature trail from the Finnish Nature Centre Haltia or from Haukkalampi to reindeer park, either on foot, Nordic walking style with poles, skis, snowshoes or kick sleds; transportation by two 8 person minibuses is also possible. 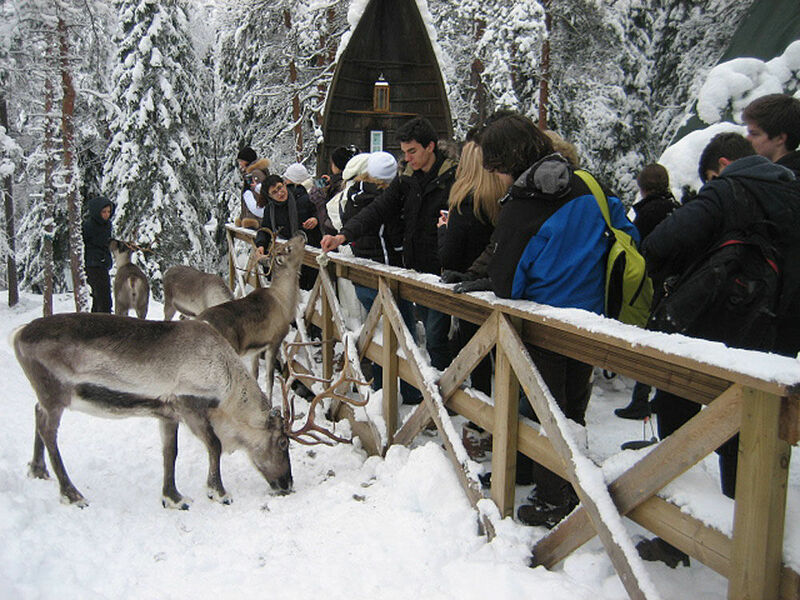 Nuuksio reindeer park is located in the national park, about 30 km from Helsinki and 1,1 km from the Finnish Nature Centre Haltia. Local trains S, U, L, E Helsinki - Espoon Keskus + bus no 245(K) to Nuuksio. The nearest exit stop is at Nuuksiontie 77, two stops from Haltia ahead. 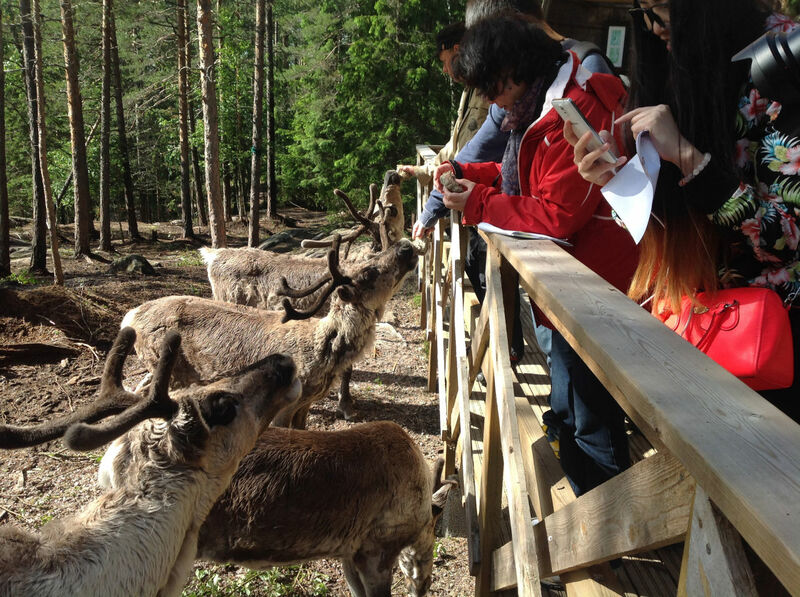 Nuuksio Reindeer Park is open for public on below mentioned dates. You don't need to book your visit in advance then. March, 13-16 (1pm-4pm): Fri 15.3., Fri 22.3., Wed 27.3., Sat 30.3. May, 13-16 (1pm-4pm): Sat 4.5., Fri 10.5., Sat 18.5., Thu 23.5., Fri 31.5. April, 13-16 (1pm-4pm): Wed 3.4., Fri 5.4., Tue 9.4., Fri 12.4., Ti 16.4., Thu 18.4., Mon 22.4., Sat 27.4. June, 13-16 (1pm-4pm): Thu 13.6., Fri 14.6., Thu 20.6., Thu 27.6., Sat 29.6. July, 13-16 (1pm-4pm): Thu 4.7., Fri 5.7., Fri 12.7., Sat 13.7., Fri 19.7., Sat 20.7., Tue 23.7., Fri 26.7., Tue 30.7. August, 13-16 (1pm-4pm): Thu 1.8., Sat 10.8., Thu 15.8., Sat 17.8., Thu 22.8., Sat 24.8., Thu 29.8., Fri 30.8. September, 13-16 (1pm-4pm): Sat 7.9., Thu 12.9., Fri 13.9., Thu 19.9., Sat 21.9., Thu 26.9., Sat 28.9.